Lil' Bits "Sunny Side Up" gives you premade element clusters, well thought out word tags and more....and trust me, this isn't chicken feed! Have a nibble, you won't be disappointed. 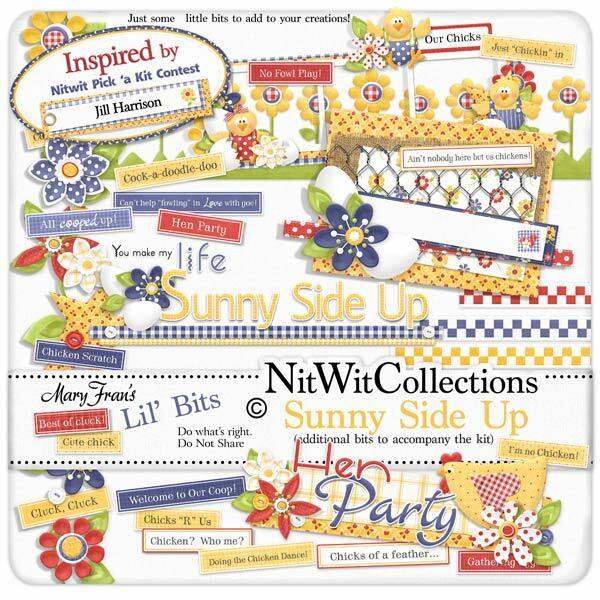 These digital elements are NOT included in the FQB "Sunny Side Up" Collection. 1 Border of hearts, stars, and flowers...all growing on a stem? What's in your garden? 1 Wordart - in a photostrip form labeled as "Our Chicks"
1 Wordart - "Hen Party"
1 Wordart - "You make my life...."
18 Word strips all filled in with phrases that we just picked up around coop!